Happy Friday, loves! To celebrate the end of the week, it's time for a giveaway! I love John Frieda hair product and am a very loyal customer. Seriously, have you ever used their Brilliant Brunette products? Ahhh-mazing. That's why I'm so excited to be hosting a product giveaway! Here it is, ladies and gents - post a comment below or Tweet at @Twentyapolis today for your chance to win your choice of John Frieda Precision Foam Color or John Frieda Clear Shine Luminous Glaze. The choice is yours! Enter now through midnight CST, loves! Love their Brilliant Brunette shampoo & conditioner! Haven't tried the glaze before... that'd be my pick! I used to use that glaze for brunettes. 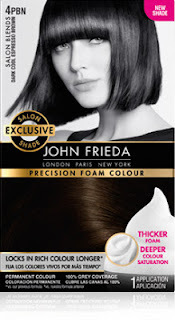 John Frieda makes great products! I LOVE the foam! My hair is very long and unlike other brands, all I need is one box and I'm covered. Of all the box color I've used (hey... I was in college once, I used A LOT of box color in that day...), this is by far the best. Salon-quality, and great for a quick fix.